Adventures with the Naked Hermit Crabs: Dugong and more at Chek Jawa! 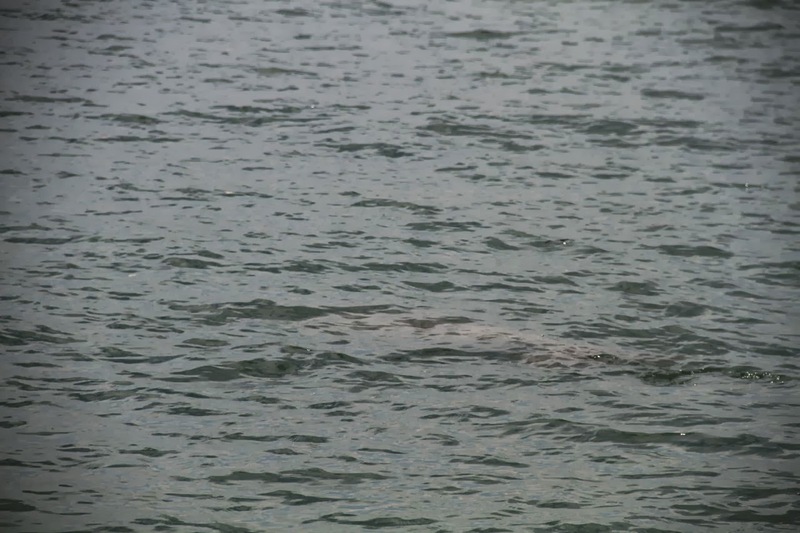 Dugong and more at Chek Jawa! 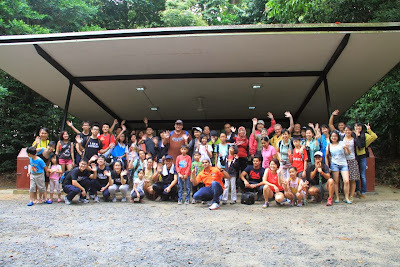 Yesterday's public walk at Chek Jawa was awesome! 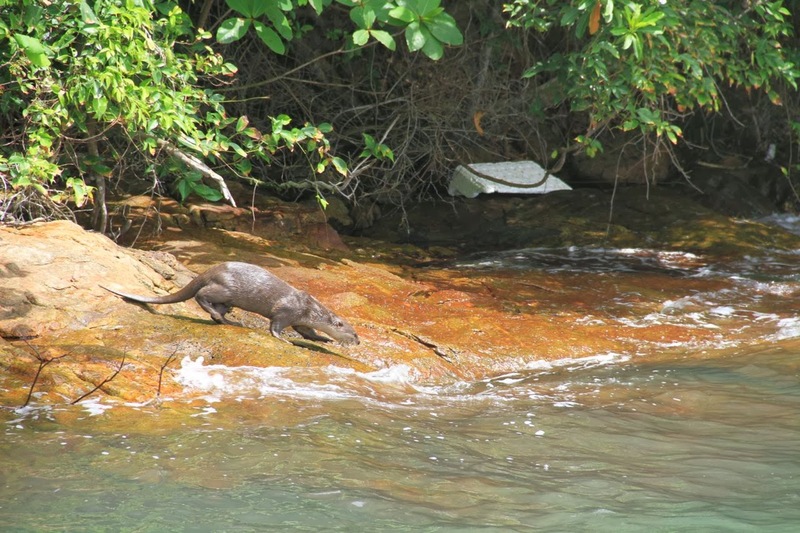 There were sightings of the white-bellied sea eagle, otter and.... a dugong! Gosh... it was so exciting, I don't even know where to begin describing the sighting! 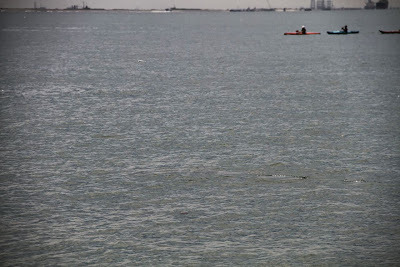 The last group (Ian Siah with his family and friends, and Bernadette and friend) led by Leykun saw the dugong swimming in the area between the Chek Jawa front beacon and the coastal boardwalk. 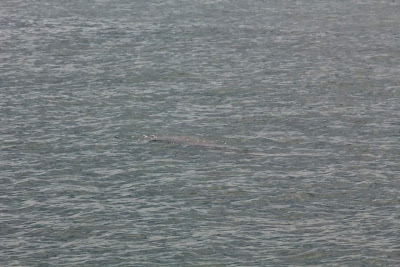 We first saw a large pinkish-brown animal with a large strong tail moved just about 25m in front of us. 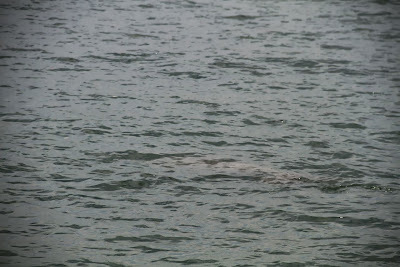 We shouted "Dugong!" and fumbled for our cameras. 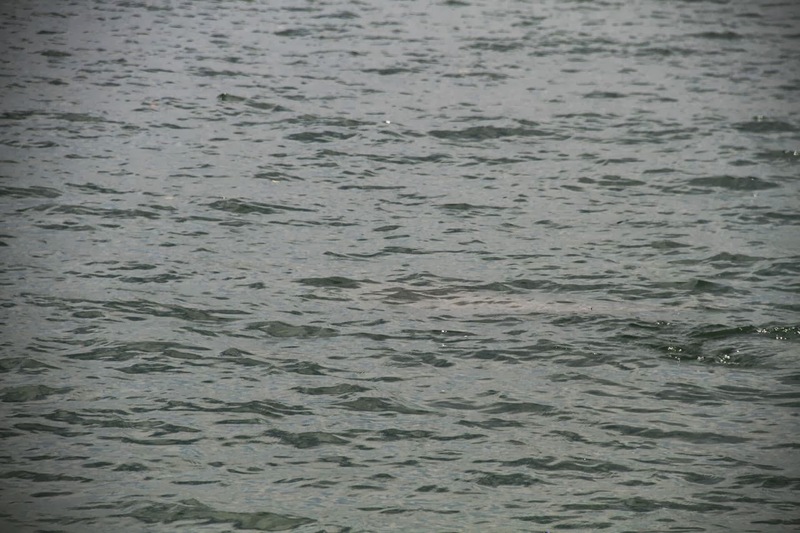 By that time, the dugong sank into the water and we could not see it any more. There were large ripples around. 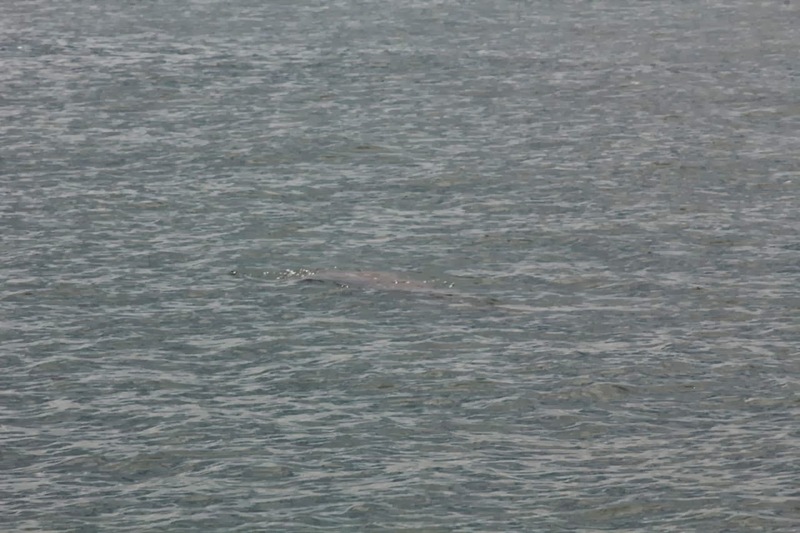 Half a minute later, it surfaced again, and its large body and tail still visible. We could tell the animal does not have a dorsal fin. 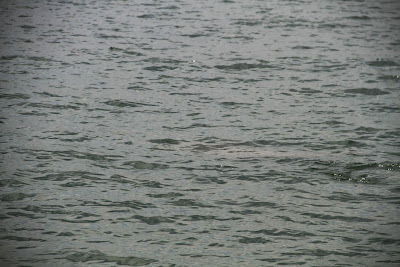 It was slow-moving, certainly not traveling fast in the water. It disappeared from sight after a few seconds. All of us hung around hoping for another glimpse of the elusive animal. And it came back, 8 minutes later (according to the timestamp on our photos), and at a location further to the right. Here are the photos contributed by Leykun and Ian. 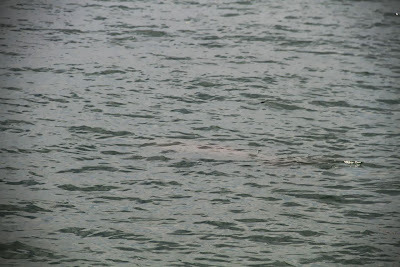 Chek Jawa has excellent seagrass meadows in the inter-tidal region, so we are not surprised at all to see a dugong in the waters off Chek Jawa although we all know just how elusive it is. The wildsingapore website has a good writeup about dugongs, what they eat, and their status and threats to survival. Do have a read. The next wonderful sighting was of an otter on the rocks on the southern side of the coastal forest. 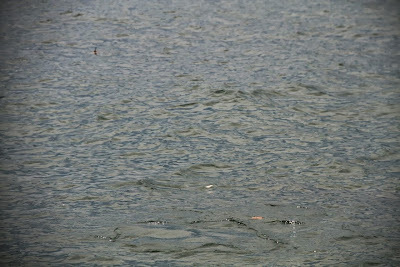 A boy in the group, Raphael, saw the head of a small animal bobbing in the water. 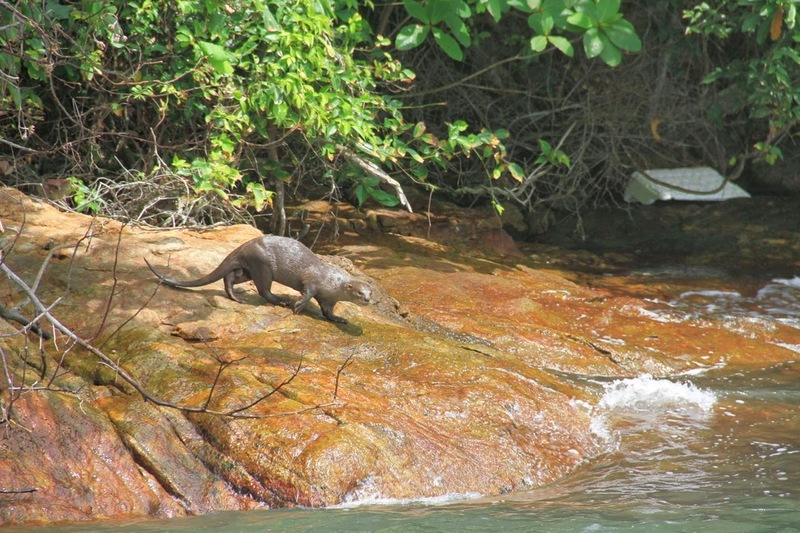 At first, we thought it might be a monitor lizard. 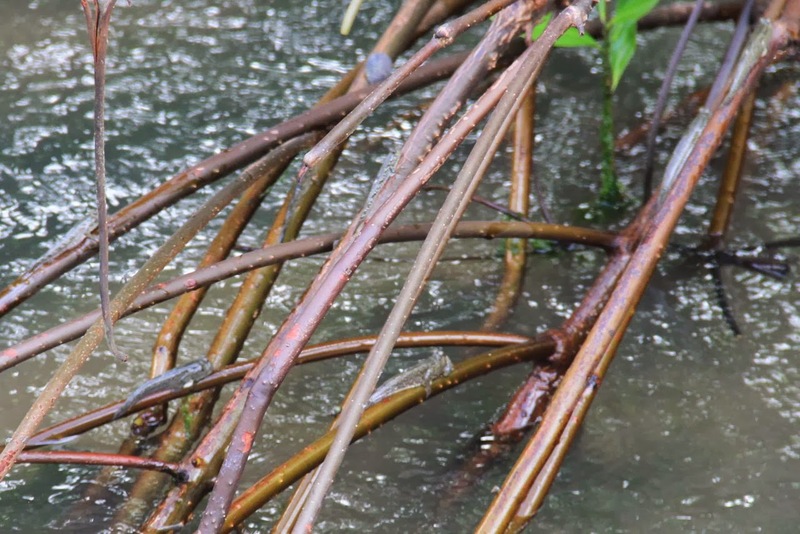 Because Raphael made us stop to look at it, we followed its movement, and discovered it's an otter! 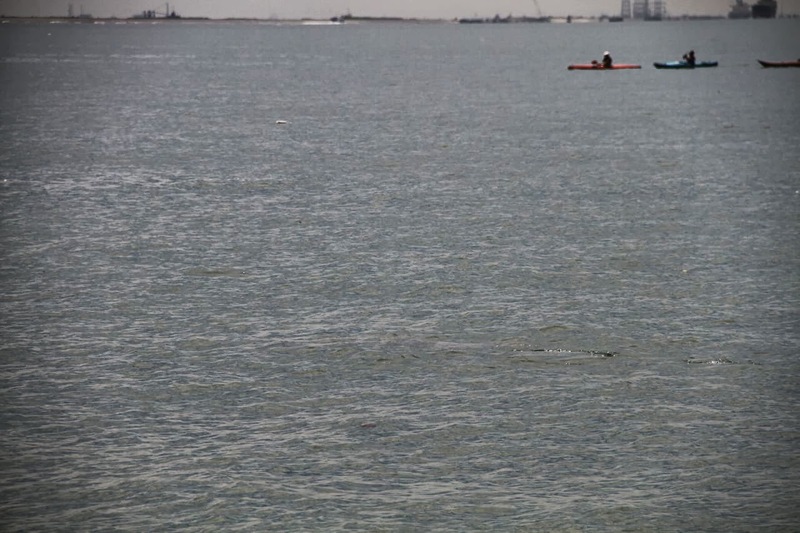 The creature crawled out of the water, moved into the shrubs before emerging on the other side, then running out and plunging right back into the waves. 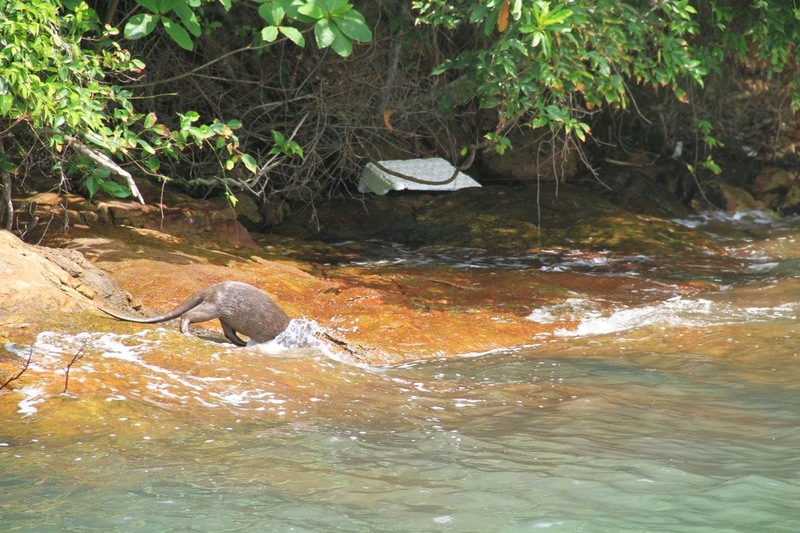 And we captured photos of the beautiful otter! Thanks, Raphael! Alright, let's get back to talk about the other animals that we saw. 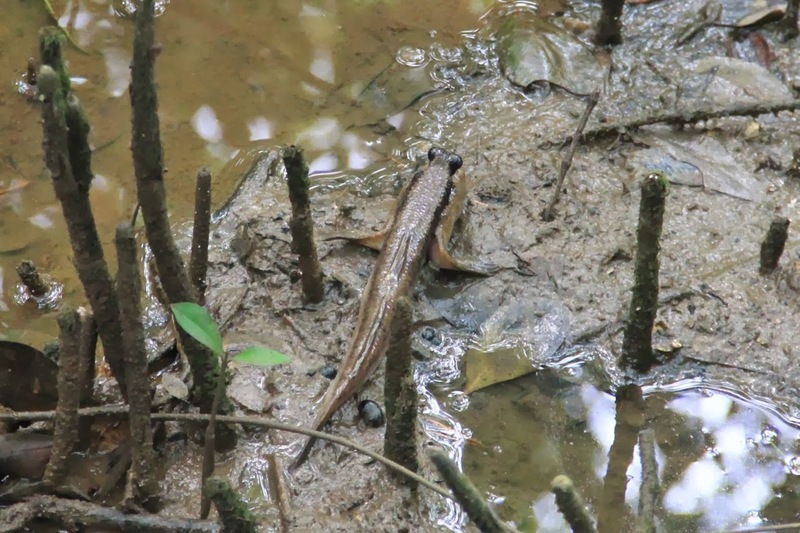 The Blue-spotted mudskipper and Giant mudskipper could be seen in the back mangroves. 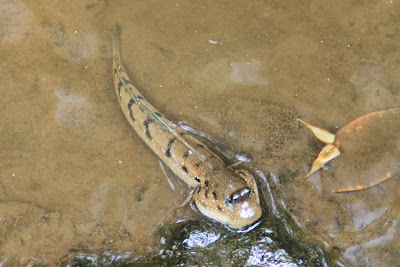 Some of the visitors were excited to see just how big the Giant mudskipper was. For those of you who have not seen them before, the adult Giant mudskipper is as long as 30 cm from mouth to tail. Actually you can see lots of these mudskippers in Pasir Ris mangroves as well as along Sungei Api-Api and Sungei Tampines, even in the mangroves just next to the HDB flats. The tide was quite high at 2.8m. The visitors were delighted to see more mudskippers at the outer mangroves, and these little fishes were clinging on to the roots of the bakau kurup trees. So cute! 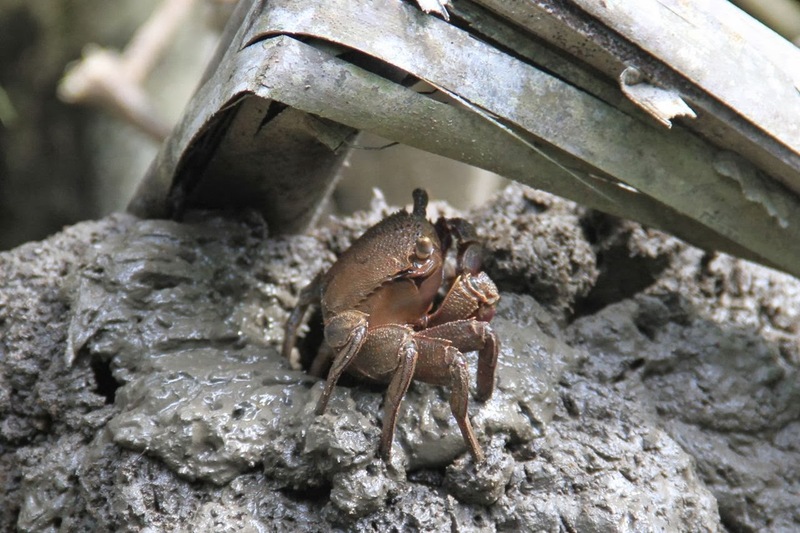 In this photo, you should be able to six mudskippers holding onto the roots. Can you see them? These are fishes which prefer to be out of water! 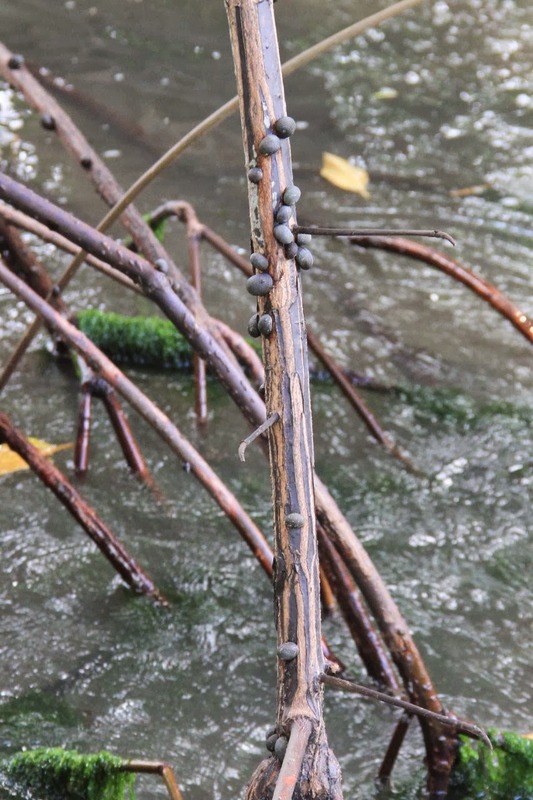 More creatures that want to get out of water. These are the nerite snails. They too crawled up the roots and stayed there till the tide drops again. 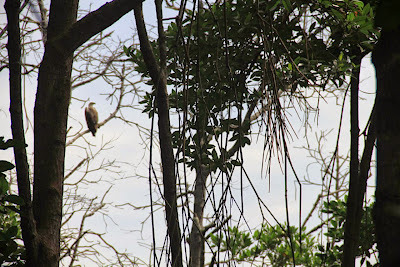 I'm quite sure all the visitors saw this White-bellied sea eagle perched on a bare branch at the outer mangroves. It stayed there for a long time, oblivious to our presence. Some of the visitors were awestruck and gushing just how wonderful it is to be able to enjoy the beauty of this magnificent raptor up close. The White-bellied sea eagle is a resident in these parts of Pulau Ubin. It is known that the White-bellied sea eagles pair for life, and they maintain a large nest through the years, whether in breeding season or not. 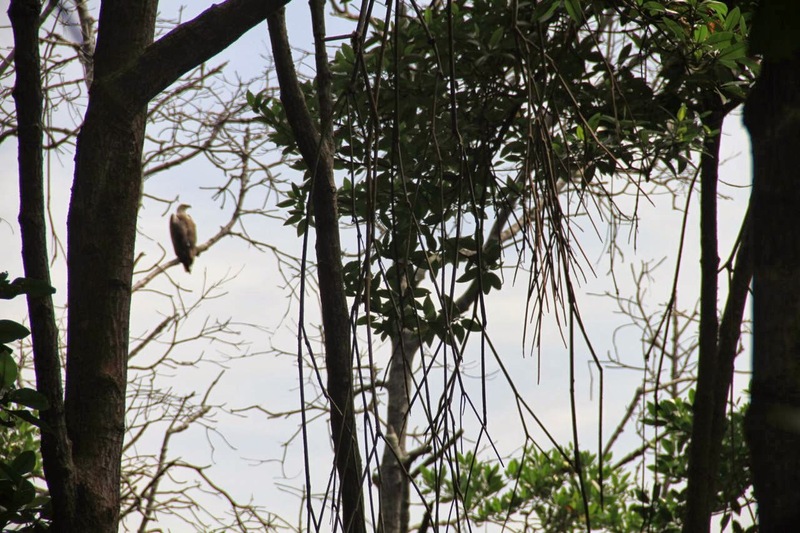 Tall trees in a forest are key to the survival of this species of raptors. 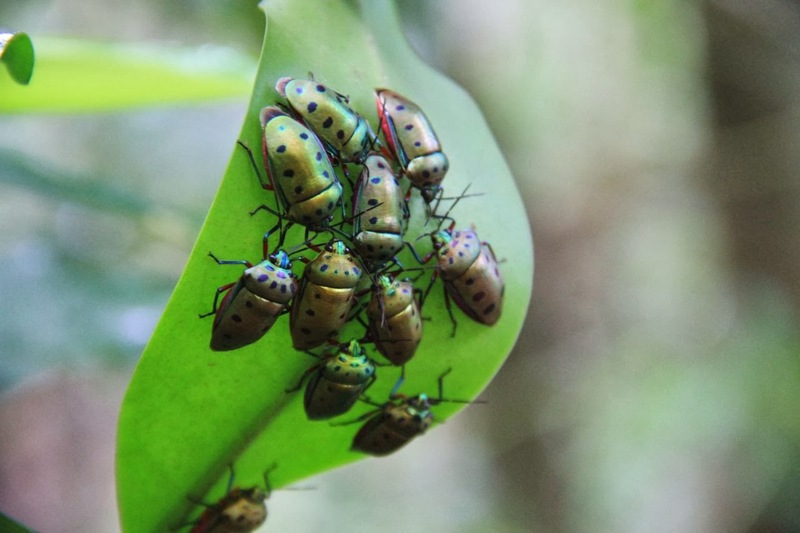 We have seen these mangrove shield bugs more often in recent months than in the past. Everyone agrees that these bugs are beautiful with their iridescent outer shells. They are often found in numbers under a large leaf. Go flip that leaf and check for shield bugs! 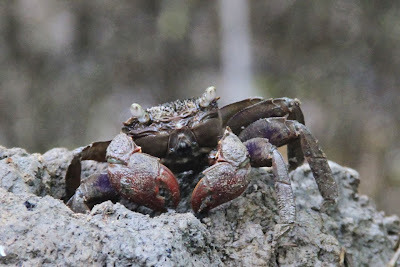 The tree-climbing crabs are plentiful in the back mangroves. 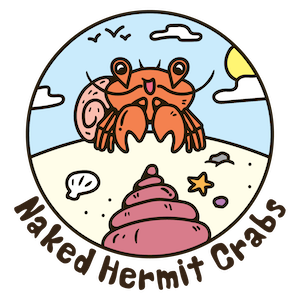 You should be able to see these crabs standing outside their burrows quite easily. To end this post, here's the Big Group photo. A "shout-out" to all our lovely visitors! Seriously, without you guys coming for our walks, it wouldn't be half as fun. Thanks for joining us, and do spread the word about our free walks. 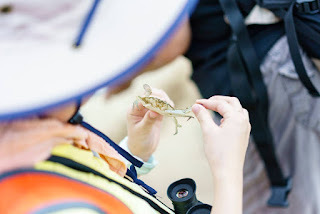 We love showing Chek Jawa to as many people who care about this natural place, home to numerous native plants and animals. 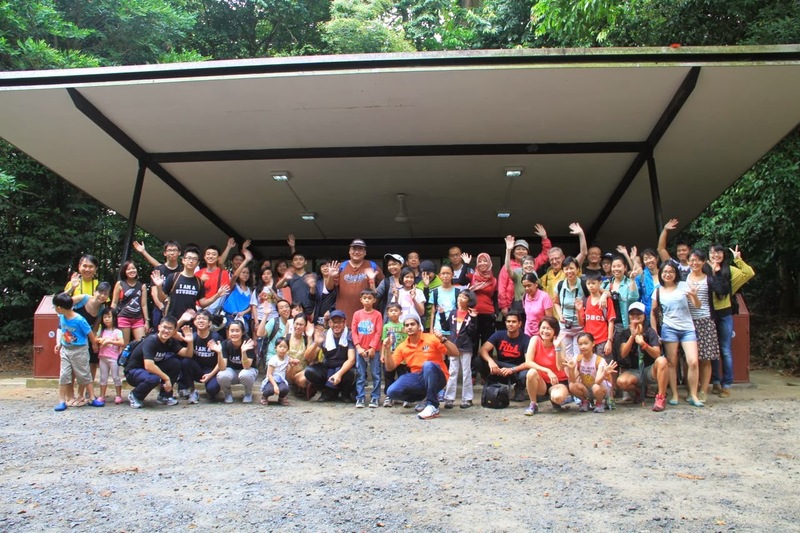 For the record, we had 65 visitors, 7 student councillors from Dunman High and 5 volunteers with us at the walk. Thanks go out to the student councillors (Jeremy, Marcus, Yu Chong, Nikki, Sylvia, Darius and YeeHan) for helping us at a few of the stations. You guys did a great job! And for the regular volunteer Crabs - Ivan, Pei Yan, Chay Hoon, Kok Sheng and Leykun.... "Thanks!" If you are interested to join us for the last 2 walks of the year, please go to our online signup page. The dates are 2 November and 7 December. We plan to take a break in January and February. Looking forward to the next 2 walks! In february I will be in Singapore for two full weeks.. but you wll be breaking... I will try to go escorted by a fried....hoping in low tide too! Mr. Tripodi, Yes, we will be taking a break in February, so we won't be having any walks. Hope you have a nice trip to Chek Jawa anyway. 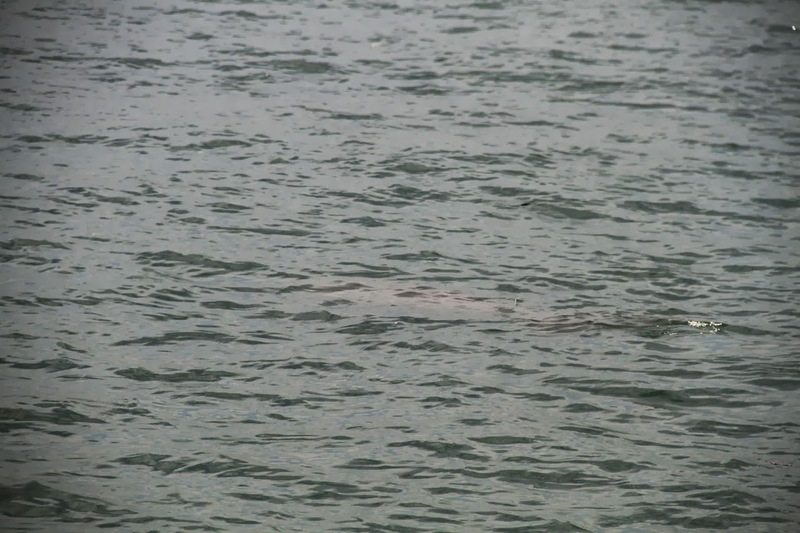 Thanks for this informative post, I've been to Chek Jawa a few times and have never expected to see a dugong there. Enjoy reading your blog!